Imagine you inherited an old teapot from your Gran. It’s a beauty; a bulbous round body, perfect for letting the tea meld and infuse. The spout is less beautiful, if anything it’s a bit dumpy, but as any teapot aficionado will tell you, it’s not what it looks like it how it pours. And this spout pours perfectly, an arc of malty brown tea curves out, with no spills, no drips, no late glugging and spluttering. And the handle; just right in the hand and curved enough away from the body of the pot itself to ensure no burns. The lid however was lost. Maybe there never was a lid, but it doesn’t matter, as you would for ever be taking it off to stick in the spoon and stir up the mash. However you look at it, it is the perfect teapot. You take it on to Flog It. Turns out the teapot is almost 1000 years old – possibly a touch more. A thousand years making brews – concoctions with feverfew & dandelions at first no doubt, but later, the fruits of camellia sinensis. There is no other teapot like it. It is beyond compare, beyond value. And it is a pot that defines. This pot is made from raw materials than root it to one area; a land of sandy heaths, salt beds, rocky outcrops, sweeping plains and high hills. Grassy tussocks and sand dunes; salt marshes, ripe with sorrel and samphire and river estuaries carrying the world’s trade. It says: “I am from here, and only here. This is my land, and I am proud”. It is priceless not just in what it is worth but also what it means. Yet the teapot is disfigured. Nameless bureaucrats with no feeling for place, no respect for the timelines of centuries cutting through the ages break the pot. They snap off the spout and roughly glue it onto a plasticine teacup. They crack off the handle thinking it will sit better with another service. And they stick on a lid that doesn’t match and isn’t needed. See, the teapot isn’t a teapot after all. It is a place. It is my home. It is disfigured, an insult to the lands my family passed down to me, the stories they told. The teapot is my county. A county with a round body for the perfect brew; a spout that connects to the sea and lands belong and a handle, that reaches into the high hills making connections, now severed for administrative neatness. But when this year’s Tour de France passes “through Derbyshire” and when the Open Gold Championship is won in “Merseyside”, I breathe: enough is enough. It is time for rebirth. 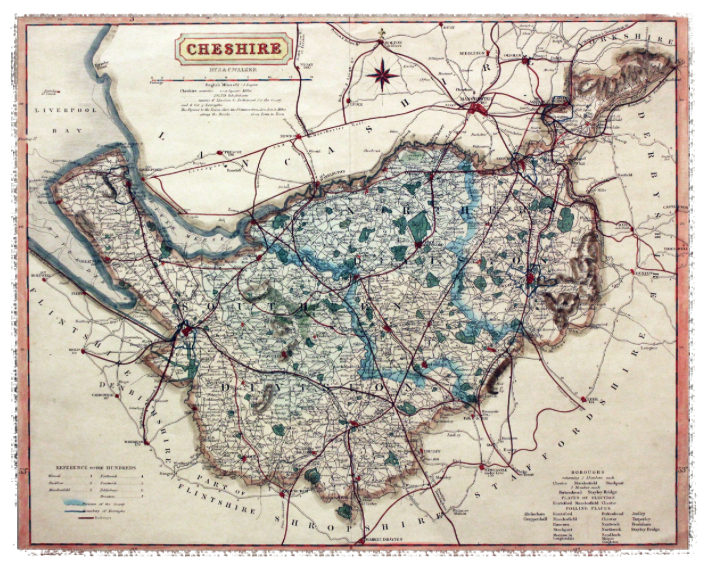 This is a map of the ancient county of Cheshire and its hundreds. Stretching from The Wirral in the west up into the High Peak in the east. Bordered to the north by the river Mersey (although this was an area of contention for many years between Lancashire and Cheshire), the south west by the River Dee and in the south east by the hills of Congleton Edge and Mow Cop. At the time of Domesday, the county spread further west into areas that are now north Wales. For almost 900 years it enjoyed its distinctive shape and became known as the teapot with no lid. On 1st April 1974, following the Local Government Act of 1972, the county ceased to exist in its teapotian form, as local government was reorganised. The main urban centres passed to other counties (Stockport, Altrincham and Stalybridge to Greater Manchester), Birkinhead, Wallasey, Hoylake to Merseyside. The new administrative area gained Warrington, north of the Mersey as a nose-thumb to Lancastrians of old. The High Peak spur was to stay in Cheshire but in the end was joined to Derbyshire because it would have become an ‘exclave’ (unattached) and therefore untidy in the eyes of the 70’s bureaucrats. I mean, we can’t have Cheshire Bin Wagons driving through Greater Manchester, can we? Today, officially, the county of Cheshire does not exist following a further reorganisation in 2009, being split into four administrative boroughs including ‘Cheshire East’ (rather than East Cheshire) and Cheshire West & Chester (rather than Chester & West Cheshire). To date, there seems to be general ambivalence (maybe lack of awareness) to the cause of reuniting the County, unlike in other areas (Huntingdonshire anyone?). But the ‘lost’ areas make up a critical part of the county’s sense of self, part of its geographic variety and in some respects cement the county’s northern roots – the border with for example Yorkshire is now lost (and indeed, some areas historically in the county of Yorkshire now lie in Greater Manchester – I mean, come on). I want to go up Longdendale in the county of Cheshire, climb up through Woodhead and Holme Moss and drop into Holmfirth for tea with our neighbours, in the county of Yorkshire again. And have that tea from a mended teapot.